It is such a pleasure to photograph children throughout their early years and Edison is no different. From baby photos when he was 3 months old, to just sitting up and photographing a nudey bum with a tea party of teddies to a dinosaur themed cake smash on his first birthday - I love being a part of making memories for you and capturing how much your little tots change and develop their own personalities and character. I found some stencils to make my own dino bunting and even followed a tutorial on Youtube on how to make tissue pompoms - note to self, a toddler offering help is NOT helpful!! 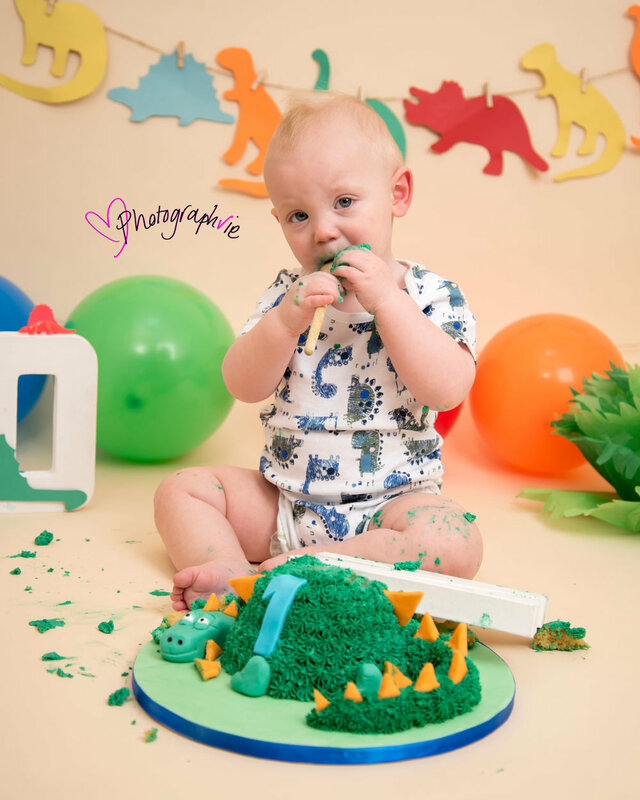 Edison was a little shy to begin with - this can happen around the 12 month age - but with a little patience, a rendition of a few nursery rhymes and mummy trying the cake too - we got some fabulous images to mark this little boy's first birthday!